You may be over Facebook. Twitter is just 140 characters, and Pinterest is a bit of a solitary pursuit. But are you on Instagram? This social media platform is tailor-made for those of us who are more visual by nature - it's about communicating with images instead of just words. Instagram is full of interesting, creative people sharing happy things. Interested to hear more, or in sharing your thoughts? Perfect! 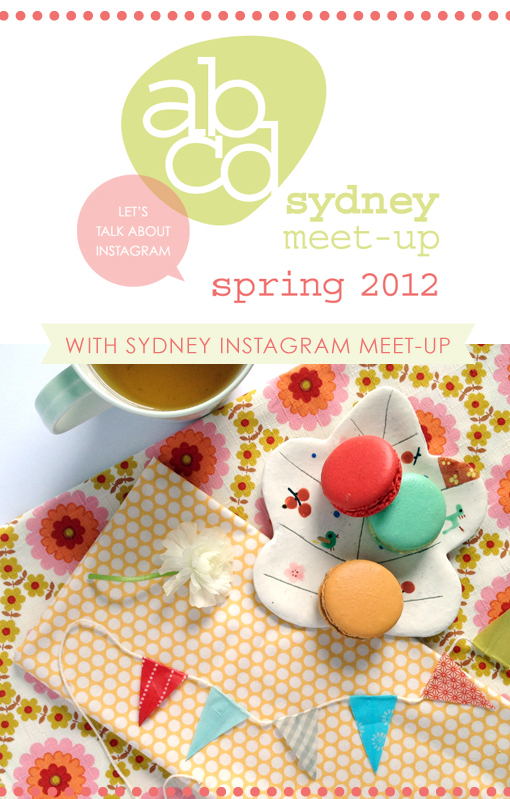 Steph of Bondville and I have organised an Instagram-themed Sydney abcd meet-up! We'll be meeting for a leisurely vintage inspired afternoon tea on Saturday 3rd November from 3 - 5pm in Lilyfield's Callan Park. Bring along something sweet to share; tea and coffee will be available to purchase from Sweet Jane's Travelling Teahouse (a gorgeous vintage caravan. Fun!) And, we'll be joined by the Sydney Instagram Meet-up folks led by Jaclyn of Little Paper Trees and Jayde of Little Paper Lane. There'll be lots of interesting new people to meet from the Sydney Instagram group, and for those who are interested, we'll dedicate about 40 minutes to small-group discussions. The aim is to share ideas and learn more about Instagram and how to use it as a personal and professional tool. Each group will be led by one of our friends from the Sydney Instagram group who'll share their insights and expertise. Are you in? RSVP in the comments section of this post to join us. We're not doing goodie bags this time, instead we'd appreciate you bringing a plate of something homemade to share for afternoon tea. We would also love for you to provide us with some feedback on Sydney abcd meet-ups in our online survey. If you weren't able to fill the survey out at our last meet-up, please click here to share your thoughts on how we can make abcd work best for you. Steph and I have had fun organising this one and we hope to see you there - it's going to be a lovely afternoon. Parking/Transport: There is limited street parking available on Balmain Rd and the surrounding streets, as well as the Sydney College of the Arts carpark. We encourage you to use public transport (see details here on Uni of Sydney website) – there are buses that run down Balmain Rd and the Light Rail stops at Lilyfield which is 1.5km walk. Or car pooling is good too!